I’ve always wanted to ride in a helicopter but lying on a stretcher in the back was not what I had in mind!! I got my wish for a ride on 16 December 2017. We were on a fishing trip at Titirangi Bay in the Marlborough Sounds and this involved clambering down an outcrop of rock, something I had done dozens of times before. On the top of the rock I lost my balance plunging 4 – 5 metres and landing on my head on the rocks below. My recollection of this is being conscious after the fall and being aware I had fallen with pain in my head and neck with a knee that didn’t seem to work. There was a lot of blood from the head wound but not a lot of pain. One of my friends ran up to the farm house and phoned 111. The situation was serious enough to determine that a helicopter was needed and so we waited for its arrival. On arrival the medic checked my bandaged head, put a neck brace on me and also a brace on my left leg. 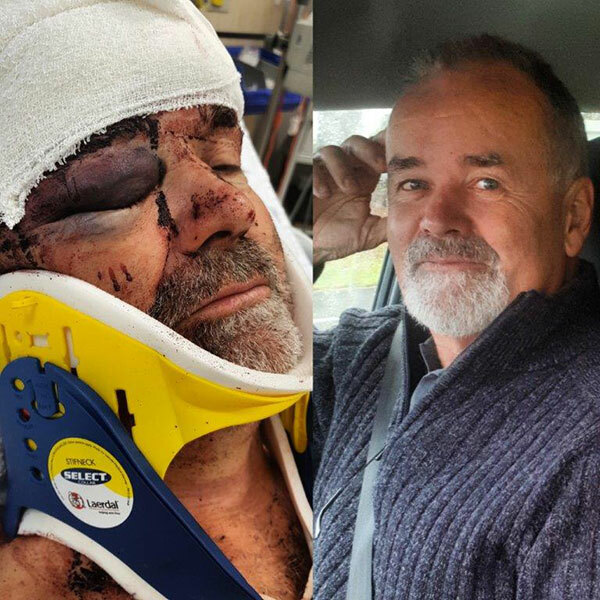 Once at Wellington Hospital it was determined I had 3 cracked vertebrae in my neck, the head wound that required over 200 stitches and in my left knee most of the ligaments were torn and some ruptured. After a week in hospital I was discharged to go home for Christmas. Once at home my wife who is a qualified nurse took over. The head wound healed quite quickly and I was seeing 2 specialists regularly with one for my neck and the other for my leg. The neck vertebrae healed within a few months and the knee specialist discharged me from his care to continue with physiotherapy twice a week which continued for 11 months. I cannot be too complimentary about ACC, the health service and most of all the Rescue Helicopter Service. I am certain that without their prompt and professional service I would not be back in fulltime employment as I am today. The medic who landed on the rock beside me was cheerful (it had all been doom and gloom up to that stage), thoroughly professional in the diagnosis and treatment of my wounds, made all decisions quickly and decisively and was an excellent communicator in that we all knew what was going on and what was going to happen. I am certain that if I had not been taken to hospital by the Helicopter Rescue Service I would not be in as good position as I am today. The blood loss alone would have been problematic as I left a trail of blood from the landing pad in Wellington to A & E as well as leaving a lot on the rocks! The ability to get patients to a hospital in as short a time as possible is vital for their diagnosis and then prognosis. The alternative to a helicopter was for me to wait for an ambulance, a 3 hour trip along a very windy and rough road each way, which would certainly have pushed out my recovery time and would probably have not been as successful. Everyone I talk to (including medical professionals) are amazed at my recovery from such a serious accident and I put it down to the promptness of getting me to hospital promptly for a full diagnosis and then the Health Service working really well. I have, and will continue to, support the Rescue Helicopter Service as I know from my personal experience the value of the wonderful service they provide. I would like to thank them all and next time I am in Nelson I would love to take them out to dinner or repay them in some other small way.